Imagination, a shred of finesse and a willingness to let go will see you through many dicey moments—your passion to ride will get you through the rest. Built for freedom, spontaneity and never standing still, the Powder Bowl is Patagonia's most versatile hard shell for riding the frontside steeps or hitting the backcountry’s promise in any condition. It features a tough, 2-layer GORE-TEX® fabric for durably waterproof/breathable and windproof storm performance. A DWR (durable water repellent) finish increases wet-weather protection by sloughing saturated snow and icy rain. The torso has a brushed polyester mesh interior to wick moisture, while slick mesh in the arms glides smoothly over underlayers. The 2-way-adjustable, helmet-compatible hood includes a laminated visor for optimal visibility and a tall collar for neck and face protection in blowing snow. Inside, a fully adjustable powder skirt (with webbing loop that attaches to any Patagonia® Snow pants) seals out spindrift and cold air, and low-profile pit zips release heat when you’re steaming on long climbs. 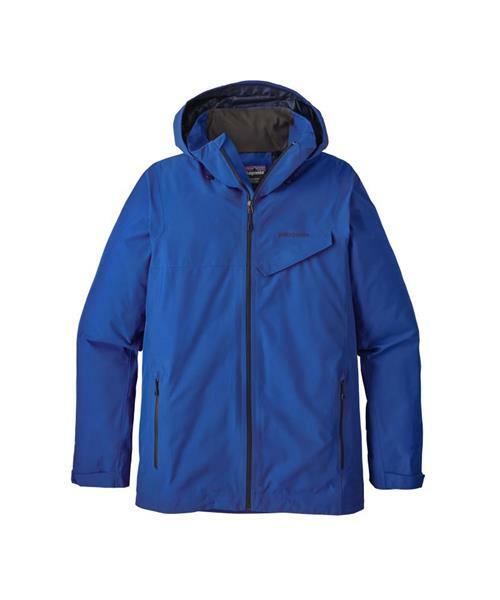 Other details include coated, watertight Slim Zips; cord-lock adjustments at the hood and hem; an embedded RECCO® avalanche rescue reflector; and a highly articulated fit for dynamic motion. Pockets include two handwarmers, one chest with a secure media pocket and cable routing, a forearm pass pocket and two interior pockets (one drop-in, one zippered stash).